I watched some pretty crazy intense movies this week, no lying. I was on the edge of the couch almost the whole time. Its rare for me to see one nail bitter in a month, but to find three in one week is unheard of. You will love these picks. 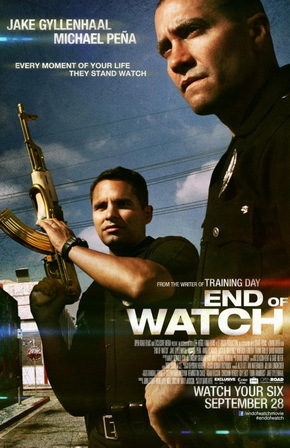 End of Watch (2012) - This movie has Jake Gyllenhaal and Michael Pena. Two outstanding actors that always give you a reason to get into the move. End of Watch is shot in a documentary style from the view of two LA cops. They are known on the streets as bad asses, taking down drug dealers and saving lives when a building is on fire. They take no crap from no one. The good feelings take a turn for the worst when they step on Mexican drug cartel turf. n the end, poo hits the fan and bullets fly. I wont ruin the ending for you because you have to watch it yourself, but you will need your tissue box. The only down side to the movie is every word is the "F" word. Every word. I couldn't let the kids anywhere near the living room when I was watching the movie, I had to wait till they went to bed. If you want to check out the trailer, click this link. I'm going to give this movie 4 out of 5 stars for language. Gone (2012) - When I first started watching this movie the girl Jll (Amanda Seyfried) pulls out a map that says Forest Park and she is marking of areas of the map. I'm thinking to myself, that map looks a lot like Forest Park in NW Portland, but how generic is the name Forest Park? There has to be a Forest Park in every state. Little did I know, the movie was filmed in my stomping ground, Portland Oregon. It was weird to see the actors running around deep SE Portland and then they turn a corner and they are in the rich area of NE, or they are hiding out under the Marquam Bridge, then they are driving over the Saint Johns Bridge. Either way, I loved this movie and I probably still would have even if it wasn't my Oregon. The story is about a girl named Jill who is suffering from PTSD after she escaped being kidnapped by a serial killer. When her sister goes missing, she finds out it was the serial killer coming back for her. Of course, non of the cops believe the serial killer ever existed and they brush her off, so Jill takes things into her own hands. In the end, she tracks down the man who kidnapped her and confronts him. It is a very intense movie that you will need lots of popcorn to keep your hands busy. There is no stop thriller action and a satisfying ending that says, "In your face Copper!" Check out the trailer here. I'm giving this movie a 5 out of 5 stars because its awesome and will keep you on the edge of your seat. Struck by Lightning (2012) - All right all you school news paper nerds (me included.) This movie is about a kid who cant seem to get anyone to respect his opinions or read any of his articles. He finds himself to be above the rest of his school even his teachers, but you have to give him a break, he's had a pretty messed up life. 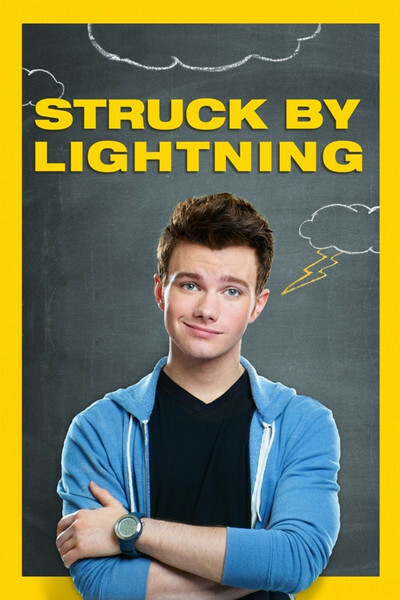 When Carson (Chris Colfer) learns that the college of his dreams won't accept his application unless he does something unique, he decides to start a literary magazine, but no one wants to write for it. What does Carson do? He blackmails a bunch of people and makes them write articles. Things get screwed up as they usually do when you blackmail people, and in the end no one reads the literary magazine anyway. Well, As the title says, Carson gets struck by lightning and dies. I can tell you that because that's the first scene that they show in the movie. If you have any suggestions on movies I should see, please message, comment or email me.